Note: You can also filter Stream activity. Go to a Contact or an Account List object in the Stream, and click (Log an Event). Choose the event type (comment, phone call or meeting) and specify if anyone else was involved. (Note: only meetings and calls allow you to choose a specific date in the past. You cannot specify a date for a comment). Record when the meeting took place. Leave a comment about the recent call or meeting, and log the event. This tracks the latest activity by adding to Reporting and Intelligence Fields in the Grid. At this time, we do not support importing individual emails in the Stream. As a workaround, you can copy and paste the text of the individual email into the Note box and log the event as a meeting following the steps above. If you enter @Jim Halpert when writing a comment, Jim receives a notification of the comment. If you enter @Sales, the entire sales team receives a notification. If you enter @all, everyone at the Organization receives a notification regarding the comment. If you enter @yourIDhere (i.e., reference yourself), you will receive a notification of the comment. You can use comments during a call or to share updates with your team in real time. In the Stream view, on the left side of the Stream, click the Account or Contact for which you want to add a comment. Enter the comment recipient by entering the @ symbol followed by the recipient's name. You can enter more than one recipient. To make text bold, put double asterisks (**) around it: **bold text**. To make text italic, put underscores (_) around it: _italic text_. To format text as a bullet list, put each item on its own line, and put an asterisk and a space at the beginning of each line. If an email in the Stream contains an attachment, you can preview and/or download the attachment directly from the Stream. Attachments in the Stream view are indicated by . To view the list of attached files, click . 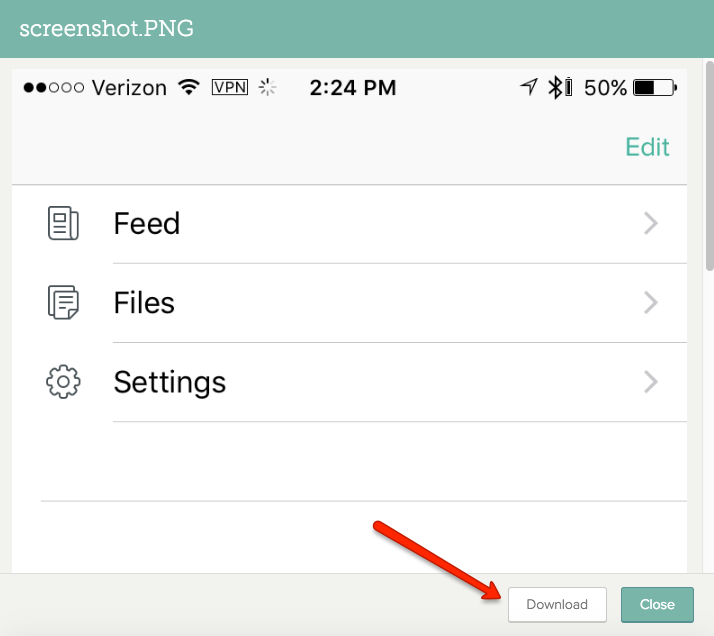 If the attachment is in a format that supports preview, such as a PDF or image file, click the attachment to preview it, and then click Download to download it. For other attachment types, click the attachment to automatically download it. To filter the Stream to show only items that contain attachments, click and check the Events with Attachments box. If multiple email messages are combined in a single Stream item, the icon appears if any of the messages contains an attachment. If the source email is deleted, the attachment is no longer available for preview or download in the Stream. A blank email message appears prepopulated with all the Contacts as recipients. 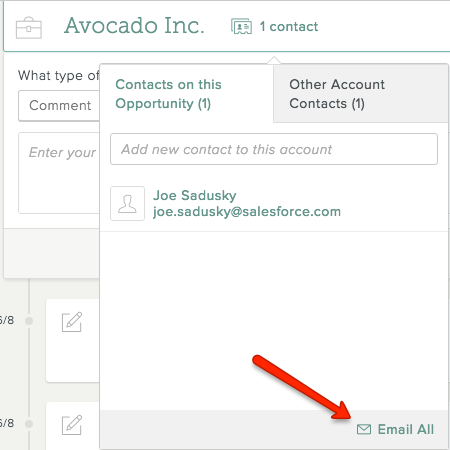 You can remove individual Contacts or add additional recipients before composing and sending the message. You can block emails that contain a given email address—either an individual or a mailing list address—from appearing in the Stream view. To do this, you must create a filter in Gmail. 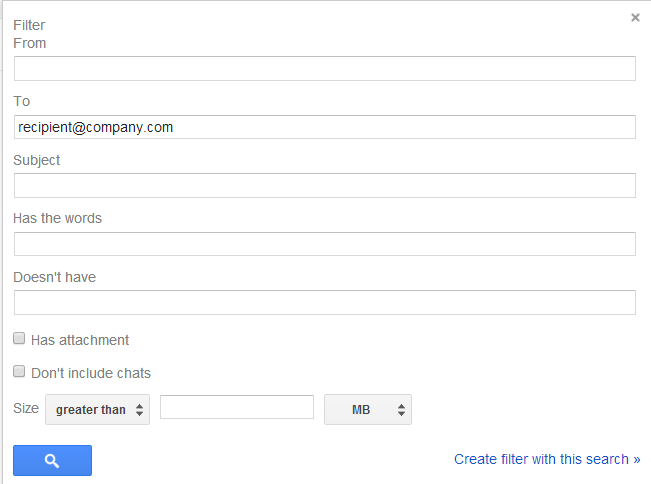 To block emails from appearing in the Stream view, all users on the affected List must create a Gmail filter. Creating a filter blocks all future emails from appearing, but doesn't affect emails already displayed in the Stream view. In your Gmail Inbox, click in the upper-right corner of the screen, and then click Settings. At the top of the Settings screen, click Filters. Note: You can also create the filter from a message by going to the folder containing the message (Inbox, Sent, etc. ), checking the box to the left of the sender or recipient name, clicking More at the top of the screen, and then selecting Filter messages like these. Enter the sender or recipient address in the From or To field, and then click Create a filter with this search. 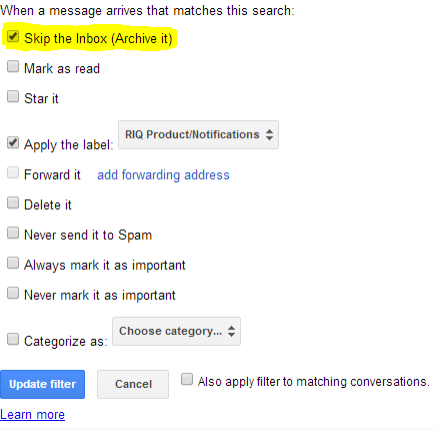 Check the Skip the Inbox (Archive it) box, and then click Create filter or Update filter. At the top of the Settings screen, click Forwarding and POP/IMAP. Select Enable IMAP, and then click Save Changes. At the top of the Settings screen, click Labels. To the right of All Mail, uncheck the Show in IMAP box. Under System Labels, find the filter you just created, and uncheck the Show in IMAP box for that also. Caution: Unchecking 'Show in IMAP' for All Mail will have the following effect -- outgoing emails (Sent emails) and auto-archived emails that bypass the Inbox (by way of a filter) will no longer be available to show in the Stream.